Please contact site administrator by clicking this link. AVPCAC was established in 2017 in an effort to harness expertise from a range of specialities across veterinary and allied health fields. 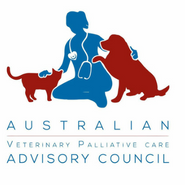 It aims to develop and support best end-of-life care practices within veterinary medicine, encourage cross discipline interaction between veterinarians and allied health practitioners to improve patient outcomes, and be a source of practical advice for veterinary practitioners looking to increase their clinical skills in this area. AVPCAC also endeavours to openly encourage conversations about death and bereavement within the veterinary and animal health field. Information provided on this site is of an advisory nature. It should not be considered or used as a substitute or replacement for veterinary medical advice, diagnosis or treatment. Recommendations as to therapeutics, diagnostics and best standards of practice are constantly evolving in the veterinary industry and are subject to change. The AVPCAC and its members disclaim liability for any damages or losses, direct or indirect, that may result from use of or reliance on information provided here. If your pet has or is suspected to have a medical problem or condition, please seek specialist advice.